Fact checking is an important part of journalism. Especially when you're working for organizations like National Geographic or Discovery. Can you spot the problem there? It says, under the Electric Eel heading, that a splash of eel blood on the eyes or lips can cause inflammation. If injected, it would take just three teaspoons to kill a person. Intrigued and (slightly)horrified, I went back to my computer and started digging. What I found was appalling. Discovery had it all wrong and messed up. I don't know about the eel blood on the eyes or lips can cause inflammation part, because I couldn't find any reference or articles on that subject. I searched for several days around the web but to no avail. But what I found was, yes, eel's blood is indeed toxic. It's so toxic, in fact, that a mere 0.1ml/kg is enough to kill a small mammal. Charles Richet, a French physiologist, injected the toxin derived from eel blood serum into dogs and observed the violent toxic symptoms. The work had led him to discover anaphylaxis-- a severe, whole-body allergic reaction which may be fatal-- and subsequently won him the Nobel Prize in Medicine in 1913. 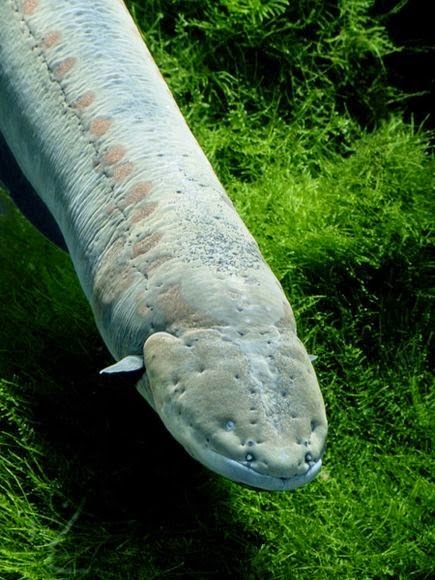 But there's a catch: electric eels are not true eels. In fact they belong to the knifefish order (Gymnotiformes), and are more closely related to catfish and carp. 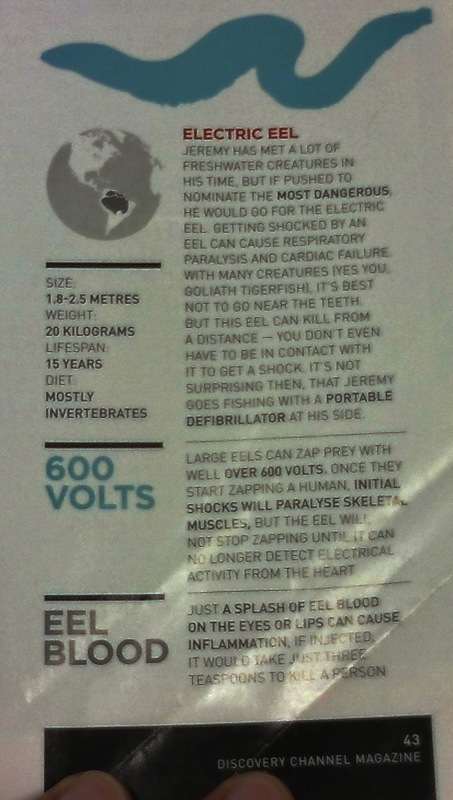 So while the blood of true eels is toxic, the blood of electric eel is not. It's obvious that the writer of the article had it all messed up because they all have eel in their names, and the editor of the magazine didn't filter out the mistake. Discovery Channel's credibility as a trustworthy documentary channel has been disintegrating steadily ever since that fake dragon show back in 2004. Rather than making a retreat back to the trustworthy camp, they continued to produce fake documentaries of ridiculous standard over the past couple of years in order to attract more scientifically-ignorant viewers. All these shows have several things in common: they all have attractive, bombastic titles; they all feature mythical creatures (except the last one); and they all make the average science-illiterate person even more scientifically-illiterate. No, Discovery Channel no longer is an authentic, accurate, trustworthy source of information. It's more like a sci-fi channel now, and the magazine is following the channel's harrowing path. 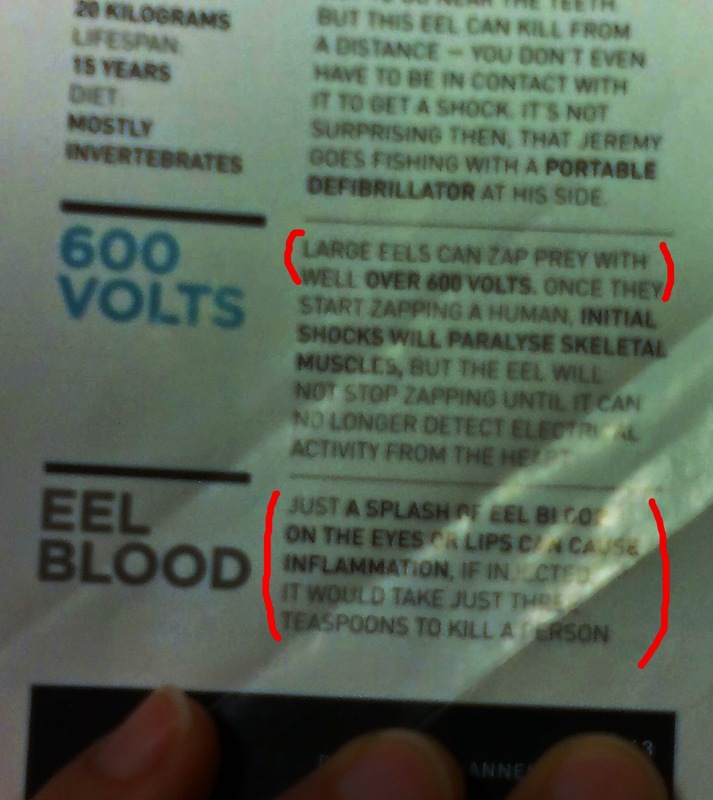 p/s: By the way, why is eel's blood so toxic? Eel's blood contains a type of neurotoxin that cramps muscle, including the muscles of your heart. It's dangerous only when injected into or in contact with your bloodstream. So it's always advisable to cook your eel before you eat, because heat destroys the toxic protein and make your meal safe.